A fine and sassy country lass! This complete garb set includes our Twill Bodice, two Gathered Peasant Skirts, a decorated Celtic Chemise, and black leather Ring Belt. Consider finishing your outfit with our optional Capitano Hat. Our cotton Twill Bodice holds in the waist and two lengths of steel boning alongside the the grommets add strength to the bosom uplift. The bodice comes in your choice of color and all are reversible to black. No corset needed! Machine wash delicate, hang to dry. Order your bodice by your natural waist measurement. Our Gathered Peasant Skirts have a double set of lacing holes in the back of the waist band, which allows for adjusting the fit should you gain or lose weight. The extra-high waist band is superior to elastic ones because it helps keep the skirt tucked in all day. You'll never look disheveled. Machine wash, tumble dry. Order your skirt by your natural waist measurement. To finish your outfit, we also include our leather Ring Belt. 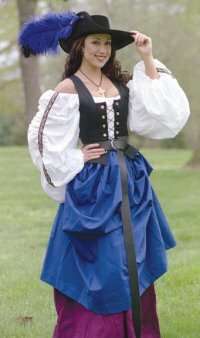 Shown: Twill Bodice reversed to black, marine and berry Gathered Peasant Skirts, Celtic Chemise, Ring Belt, and optional Capitano Hat with Blue Feather.